Getting a suitable drainage system in your basement conversion should be relatively straightforward, but everyone seems to have nightmare stories about plumbers, so you will need to make sure you don’t end up in hot water. You will need to have an adequate basement plumbing and a water supply in your basement if you are going to use your basement conversion for a bathroom or a kitchen or you want any kind of water mains down there. In order to do this you may have to do some realigning of your current drainage system to supply basement water. You will need to extend the pipes for basement plumbing from the rest of the house down into the basement, you may also have to move your drainage system one floor lower by connecting the pipes through or behind the walls. If your drainage and waste system has been located on the bottom floor of your house this will need to be moved down to your basement level. Before any work is started on the basement plumbing you will need to switch off the water supply to the rest of your house.You will then need to work out where you want the various appliances to go, for example a sink or dishwasher. You will find it a lot easier and less hassle if you locate the appliances underneath similar ones upstairs. For example if you have a downstairs toilet and want to fit one into your basement you will need to be able to access the pipes and the drainage system. You will find it a lot easier to hook up your new system to one that is already in place. Once you have decided what is going to go where you will need to choose your pipes and plumbing fixtures as well as install new faucets. You will need to hook up your various appliances to the water mains, which you should be able to do yourself once a plumber has moved or welded the new pipes together. You will need to make sure you have adequate drainage in your basement plumbing to protect against flooding. Rainwater will be the main cause of flooding for a basement so it is important to be prepared. You may need to install a check valve which will help stop sewage from flowing into your basement or make sure that the drain in the basement is not attached to the sewer in any way. You will need to find a way of making sure the rainwater does not come into your basement plumbing, one way of doing this is to install a footing drain which will have holes in it and allow for some of the water in the ground to enter it. This kind of drain will collect basement water as it comes into your basement through the walls, it will then transfer it to either a drain outside of your basement, which will prevent any flooding. Plumbing installation is more important in your basement than it is in any other part of your house. It is not recommended to carry out the plumbing yourself in a basement as you will need to make sure that your waterworks are all in working order. 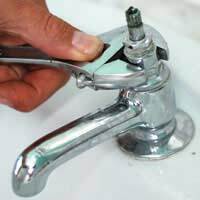 Once you have got all of the main parts of the plumbing installation such as the pipes leading to the toilet and the sink areas you may be able to do some of the smaller work such as changing the faucets yourself, but be careful when it comes to carrying out the plumbing yourself as you don’t want to find yourself in hot water.